Chuck Royce established a culture that aligns the interests of each employee at Royce with those of our Funds’ shareholders. With our firm's inception more than 40 years ago, Chuck Royce established a culture that aligned the interests of each employee at Royce & Associates with those of our Funds' shareholders. 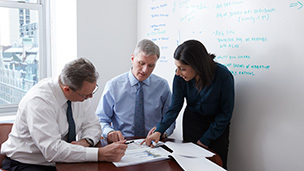 That core tenet is alive and well today, demonstrated by Royce employees often being the largest individual shareholders in many of our portfolios. We not only take a long-term approach toward our investments, we also take a long-term approach to our people. What makes Royce unique among investment managers? Investing in small companies is our core business. We have a large and highly experienced investment staff with multiple decades of small-cap expertise. We bring a formidable amount of knowledge and experience to an asset class that is not always well understood or effectively followed. We have outstanding people. Great people are the backbone of our collaborative culture, and that culture is what ultimately drives success for our investors. That is how we measure our success—by the value we create for our shareholders. Small-cap equity specialists offering mutual funds with distinct investment strategies designed to meet specific investor needs. Small-cap investing is our primary business. This distinguishes us from most other asset managers. We’ve been cultivating our unique small-cap focus for more than four decades. Have questions? Let us know how can we help you.